Everybody likes burly and solid biker jewelry. Even if you have never owned a two-wheeler, you can still rock a biker ring or bracelet provided you have the right attitude and you know how to style your whole look. In case you don’t have a proper biker item but you really want to get one (or two, or more), we reveal five silver biker jewelry pieces you should definitely try. Many years ago, bikers wore wide leather wrist pieces to protect their wrists from fatigue while riding. With time, those transformed into recognizable biker bracelets – wide snuggly fitting leather strips adorned with chains or studs. Today, there are several popular bracelet designs – cuffs, chain bracelets, leather bracelets, fancy bracelets, etc. If you want to retain an original biker look, you can go with a classic silver bracelet. But if you desire to make your appearance more fashionable, our advice is a bracelet weaved from a few leather cords and emblazoned with silver details. If you wear jeans (who doesn’t, ha? ), a massive and compelling belt buckle is the spot-on item to spruce up your appearance. With a changeable buckle, you can amp up any belt. Whether it is a fashion-forward belt or traditional crocodile piece, an eccentric buckle will turn those into something out of ordinary. These items are normally made of solid silver that is simultaneously sturdy and attractive. Whether you gravitate towards skull design, Iron cross styles, or tribal patterns, there is no lack of options to choose from. The most popular neck jewelry for bikers is chain necklaces. A burly silver chain with thick links – this is more than enough to emphasize your masculine appearance. An excellent fashion choice is to pair a necklace with a bracelet of the same weaving and style. If a chain necklace is not to your liking, you may opt for a discreet leather cord with a silver pendant or even a leather choker. There are also long slender neck pieces combined with cross pendants or whatever pendants you prefer. Some might say that wallet chains are out of fashion. We tend to disagree. For bikers, those are essential attributes of the manly appearance. Wallet chains look especially cohesive if you team them up with a belt bucket made of the same metal. Speaking of metals, silver wallet chains are the most popular options. They are tough and durable. On top of that, bikers don’t mind rocking brass or steel chains. If you like a down-to-earth retro style, you can give a leather wallet chain a try. Now you know what items you need for a textbook biker look. 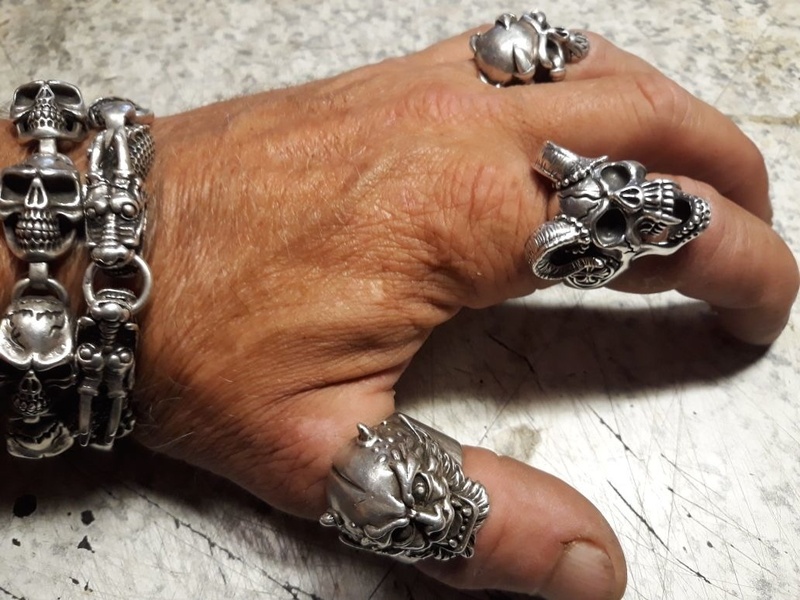 Let us know in the comments below which pieces of biker jewelry you already have and which you’d like to add to your collection.